Just a month ago, posts on social media were buzzing with the news that industry veteran Larry Italia had joined d&b audiotechnik as the new territory manager Americas and president/CEO of d&b audiotechnik Corporation, USA. In this role, Italia, now relocated from Southern California to Asheville, NC, is responsible for all d&b business in North, Central and South America. Until recently, Italia was VP of Sound Image’s integration division. Before joining Sound Image in 2015, Italia built a distinguished, decades-long career at Yamaha, where he served as VP and GM of Yamaha Commercial Audio, responsible for all aspects of the business in North America. One of the best known — and certainly popular — figures in the business, he agreed to chat with us about his past, present and future. FRONT of HOUSE: So how did you get started in pro audio? Were you the guitarist in the band who owned the P.A.? Larry Italia: No, I was the guitar player who worked my way through college, part time in a music store. It was a Yamaha dealer — a piano/band instruments store — and this was back in the day when synthesizers were still “synthesizers” and you had to patch things together with a lot of this “what’s this sawtooth wave and what’s this oscillator” kind of stuff. They had some Yamaha synthesizers that weren’t selling because no one in the store knew how to make them work. I wasn’t a keyboard player — although I was a music minor at the university and had been studying piano. I figured out how to make the synths make noise and they started selling. This was in the late-70’s/early-1980’s. Pretty soon, Yamaha’s district manager started noticing the sales numbers coming out of the store, and we became friends. I was playing actively and doing a lot of studio work on some records that did well on Billboard’s jazz charts. Sometimes I’d attend a record release party and get pissed off because on hearing the record, I’d wonder what happened to my guitar, which sounded great in the studio and on playbacks of the tracks off the tape. I started getting particular with engineers and was getting a lot of technical double talk. So I decided to learn what all that stuff meant. I got serious about my home recording gear, trying to learn audio from the ground up. What shifted you into contracting/sound reinforcement? I can’t recall exactly how it happened, but I began working with a guy who owned a sound contacting company about the time that the TEF machines were just starting to be widely used [mid-1980’s]. He was upset because he was putting in systems — particularly in performing arts venues that measured right, but didn’t sound good to him. He helped me learn more about the technical side, but wanted me to work as a sales engineer and listen to the jobs he had just finished and tell him if they sounded good or not. It was a nice day gig and it gave me nights free to be out playing. After working with the sound contactor for a while, I got a call out of the blue from that Yamaha district manager I knew and he offered me a job working for Yamaha in California. I flew out for an interview, was hired and that started a 27-year chapter in my life with Yamaha. After that long run, I wasn’t sure if I should retire, but after taking a summer off, Dave Shadoan of Sound Image called me and I worked for him for about two and a half years, running the integration division of his company. Later, the Germans from d&b audiotechnik reached out to me, and now here I am at d&b USA’s headquarters in North Carolina. Are there certain Yamaha products you were particularly proud of? I am actually proud of all the products Yamaha came out with during that time; but for me in particular — from a business point of view — was the PM1D . A lot of new business processes and marketing strategies were put into place around that. There were other digital consoles on the market at that time, but none of them sold in that quantity and as widely used as the PM1D was. Initially, there was a lot of trepidation about going into a live console platform then, transitioning from analog technologies such as Midas and 4K’s. We had to think a lot about how to make that more comfortable for end users. For that to happen, the dealer channel and distribution was going to have to be very different. The PM1D product stood out, as did the PM5D — its 2004 successor — which stands out because there were a lot of things we contributed from the U.S. side that were incorporated into the console. The DM2000  was also cool in terms of the feature set and the price — sorry, but I’m starting to sound like the Yamaha hit parade. In 2015, going from Yamaha to Sound Image must have been quite a change, because you were moving from the manufacturing side to an end-user side. Well, I had been working as a sound contactor before I went to Yamaha, and everyone said it would be very different, but to be honest, from a manager point of view, there are a lot of similarities. When I was running Yamaha Commercial Audio, audio was not Yamaha’s primary business. They were mostly a musical instrument manufacturer and a B2C [business-to-consumer] company in music and consumer electronics. We were running a B2B operation and although we had a lot of potential, we were the red-headed stepchild. It was the same at Sound Image, where their touring division is much larger than the contracting side. Sound Image was certainly culturally different from Yamaha, where 75 percent of its workforce did not show up for work in shorts, t-shirts and flip-flops. Yet they may not be as different as you might think. That’s true. I have been fortunate to work for some great companies. Back to your move to d&b… how did that come about? I was approached by a recruiting company in New York who was helping them find a territory manager and they contacted me. To be honest, I have no idea where they got my name. When they called, I said it was a great company and I was flattered, but I had a great job. I was living in the mountains of North County San Diego and was happy where I was. They later came back to me and I got together with Amnon [Harman, d&b audiotechnik CEO] and Stephan [Greiner, d&b chief sales officer], and we talked about what they wanted to do here in the Americas. A lot of those things were the same things I had done in building up Yamaha’s commercial audio business. Most people think of that in terms of what it became, but when I began, there were only four of us — and an intern! Now d&b audiotechnik is not a small organization, but they have big growth expectations. 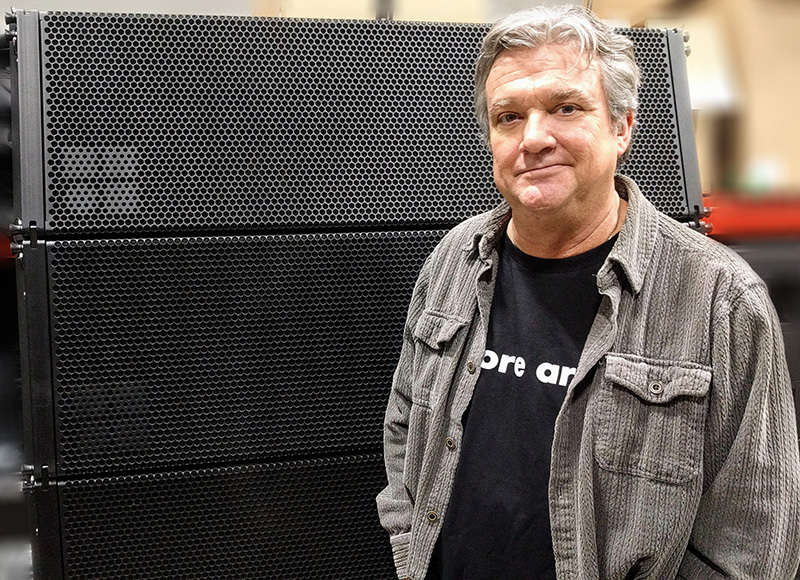 In the past year, d&b audiotechnik has unveiled some bold new technologies — the new SL series line arrays and the Soundscape immersive audio system. Any clues as to what we may see next? I would have to get an NDA from you to talk about new products! However, I can speak to d&b efforts to integrate with third party devices and protocols. It has only been within the past few weeks that I’ve learned just how much d&b are at the forefront of integration with console plug-ins, media control systems; such as, Q-SYS and Creston, the OCA [Open Control Architecture Alliance], Dante, and more. We’re always working on new toys and there are some major things coming soon so stay tuned. I’m a little more at liberty to discuss business strategies. There are some segments that d&b wants to focus on and one of them is the contracting and installation market. I think one things that attracted d&b to me was that I am coming with current and very practical knowledge of that business. I have a pretty good idea of what integrators need to see from a manufacturer to create the best conditions to do business together. Come by and see us at InfoComm! For more information, visit www.dbaudio.com or stop by the company’s booth at InfoComm, Booth #C982.